Greetings again to all our friends including our amazing customers, many who have bought Woodapple Farms Goat milk soaps and other products since 2008. Before we share on a new topic, a few updates are in order. The pignut hickory and paw paws did finally break-bud and leaf-out, so in the world of late-to-the-dance trees, spring has arrived. 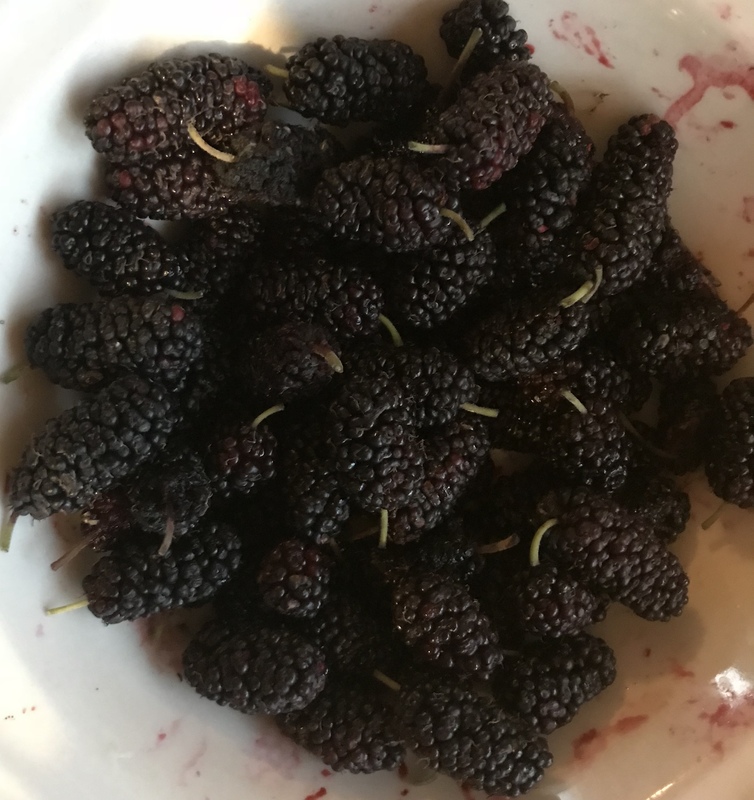 The mulberries are still producing plump, juicy berries and the cedar waxwings are still unwanted guests to the berry feast. I’m too much of “a softie” to pepper them with rat-shot, and don’t have one of those fancy air-cannons that wouldn’t have met with approval from our dogs anyways. I have heard that a recorded hawk call can be effective at keeping the thieves away from our fruit. I did notice, however, that the cedar waxwings work the upper branches harder than the lower, and we the reverse. Plenty of berries still drop to the delight of the goats and chickens, while adding purple highlights to the white coats of our livestock guardian dogs lying under the shade of the tree. We received our “package of bees” on April 24th and inspected the hive with a more experienced beekeeper friend on May 5th. These bees, it turns out, were not part of a “bee nuc” (nucleus colony) with frames of brood and honey to get them started, but simply the bees themselves. So, the bee colony had to pretty much gear-up from scratch with a little organic sugar water as a boost. Thankfully, our immediate yard has significant abundance and variety of flowers in bloom, enhancing conditions for the foraging worker bees. We needed to do a little housekeeping with the hive inspection including cleaning up some comb being built in the wrong spot and tightening up the frames. 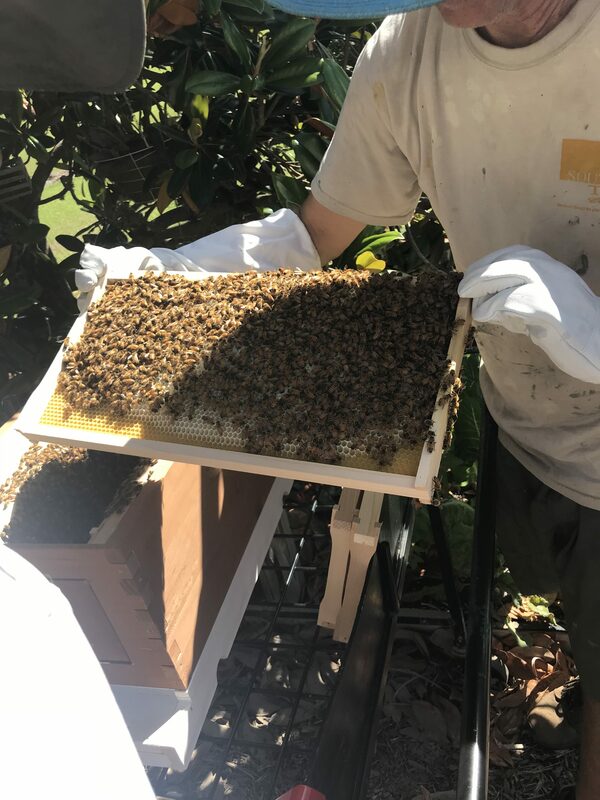 We pulled and inspected all the frames and determined the bees had already progressed well on three of the frames with many freshly laid and capped worker bee brood cells. We didn’t spot the queen, but saw plenty of evidence she was doing her job. So far this hive has been very calm and I only sported a pair of gloves and a smoker. 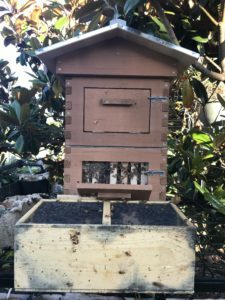 We spend time observing the comings and goings at the hive entrance, so the bees are somewhat conditioned to our presence. We still have PLENTY to learn, and I know, this will always be the case. MARKET & SOAP UPDATES – Huge thanks to all who came out on April 28 and 29 for the Brooksville Blueberry Festival. It was wonderful to see so many folks support this local event in it’s first year. From all I could tell, the feedback on the event was positive both for the vendors and the attendees. We loved seeing some of our old friends and, as always, enjoyed the opportunity to share our passion for hand-made natural products with new folks. One of our best sellers during the festival was our patchouli soap. In fact, we are currently sold out until a new batch is ready on May 15. Patchouli is definately a scent that evokes strong emotions, both positive and negative. However, I have found that many of the patchouli “haters” are surprised to find that they enjoy patchouli blended with other essential oils. 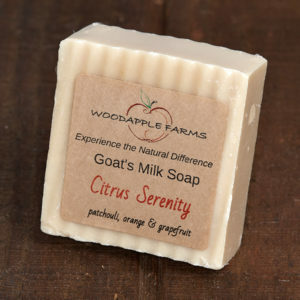 One of my personal favorites is a blend of orange, grapefruit and patchouli which we have named “Citrus Serenity”. One reason to consider including patchouli oil in your essential oil regimen is all of the therapeutic benefits this oil has to offer. Extracted using steam distillation of the leaves and flowers of the plant, patchouli oil is thick, and golden to amber in color. Patchouli oil has been been used in Asian medicine to help treat skin and hair problems such as dermatitis, eczema, acne and dandruff; and has antimicrobial and astringent properties. It has also been shown effective in relieving anxiety, stress and depression and is used as an aphrodisiac in some cultures. These are just a few of the reasons you may want to give this “hippie scent” another chance! Okay. You’ve convinced me to try the new “hippie scent”. 😉 We picked up some soaps and some oils at the Blueberry Festival and we’re all loving them. The lavender oil is especially working very well by the way. Sounds like your new bee 🐝 family will be so happy on your farm. But, really who wouldn’t? Please keep me updated-I would love to receive new info. from you. Thank you so much for contacting me! I plan to bring perfume sticks to The Art Affair Gallery next week and also hope to have some more seasonal and new scents available.